Available from the Fire Protection Shop are a range of Stackable Hazardous Substance Cabinets that are ideal to use to make the most of limited floor space. The cabinet has an extended lip at the top corners for safely holding the cabinet above in place. The cabinets feature double doors with a 3-point lockable handle (supplied with 2 keys), a single galvanised shelf and integral base sump. 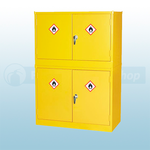 The cabinet complies with the Highly Flammable Liquids and Liquified Petroleum Gas Regulation 1972 and where appropriate, the Health & Safety Executive Guide HSG51 and DSEAR 2002.